Richard Dawkins, the world's most famous evolutionary biologist, presents a gorgeously lucid, science book examining some of the nature's most fundamental questions both from a mythical and scientific perspective. Science is our most precise and powerful tool for making sense of the world. Before we developed the scientific method, we created rich mythologies to explain the unknown. The pressing questions that primitive men and women asked are the same ones we ask as children. Who was the first person? What is the sun? Why is there night and day? The myths that address these questions are beautiful, but in every case their beauty is exceeded by the scientific truth. "Exhilarating. The clearest and most beautifully written introduction to science I've ever read. Again and again I found myself saying "Oh! So that's how genes work!" (or stars, or tectonic plates, or all the other things he explains). Explanations I thought I knew were clarified; things I never understood were made clear for the first time. My favourite adjective of praise has always been "clear," and this book has clarity all the way through." --Philip Pullman, author of "The Good Man Jesus and the Scoundrel Christ" and the "His Dark Materials" trilogy "I wanted to write this book but I wasn't clever enough. Now I've read it, I am" --Ricky Gervais "I am often asked to recommend good books on science for young people. From now on, I will not have to hesitate. 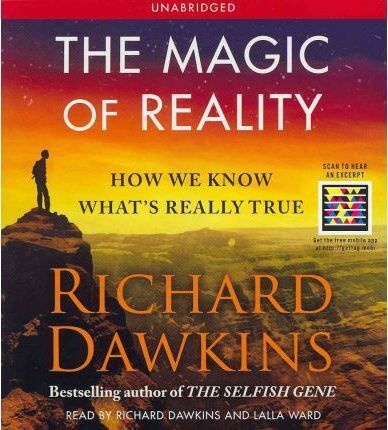 "The Magic of Reality" provides a beautiful, accessible and wide ranging volume that addresses the questions that all of us have about the universe, separating often too-little known facts from too-frequently believed fictions. For this reason it should be a powerful resource for people of all ages, written with the masterful and eloquently literate style of perhaps the best popular expositor of science, Richard Dawkins, and delightfully illustrated by Dave McKean. What more could anyone ask for?" --Lawrence Krauss is Foundation Professor and Director of the Origins Project at Arizona State University and the author most recently of "Quantum Man", and "A Universe from Nothing"
Richard Dawkins is a Fellow of the Royal Society and was the inaugural holder of the Charles Simonyi Chair of Public Understanding of Science at Oxford University. He is the acclaimed author of many books including The Selfish Gene, Climbing Mount Improbable, Unweaving the Rainbow, The Ancestor's Tale, The God Delusion, and The Greatest Show on Earth. Visit him at RichardDawkins.net. Richard Dawkins is a Fellow of the Royal Society and was the inaugural holder of the Charles Simonyi Chair of Public Understanding of Science at Oxford University. He is the acclaimed author of many books including The Selfish Gene, Climbing Mount Improbable, Unweaving the Rainbow, The Ancestor's Tale, The God Delusion, and The Greatest Show on Earth. Visit him at RichardDawkins.net.